You have found a website dedicated to the Truth of the Cross and the Word of God. May you be blessed with the Good News that Jesus Christ is the SON of GOD, and that he has REDEEMED the Souls of all men in the 1st Redemption of the Cross! There is yet a 2nd Redemption to come, when Jesus returns in the Rapture to REDEEM our corruptible earthly bodies and change them to GLORIOUS incorruptible heavenly bodies, that will be like his own in Heaven for all those who have accepted Jesus Christ as their Savior. The KINGDOM OF GOD e-book presented here is a summary of three softcover books that are now available or will soon be available to purchase by mail or online on a different website. At the present time only one of the books is available for purchase. 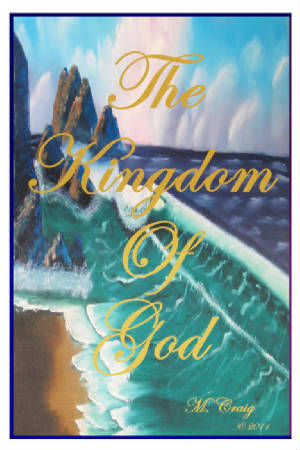 It is called THE KINGDOM OF GOD and can be ordered from "HIS GLORY LIVES PUBLISHING website" www.hisglorylivespublishing.com. This link is provided to their website for the purpose of furthering the gospel message. Disclaimer: Any books sold through HIS GLORY LIVES PUBLISHING are the sole responsibility of HIS GLORY LIVES PUBLISHING and are not connected to any church or business advertised on this website. All material provided of books available by HIS GLORY LIVES PUBLISHING are posted by permission and is protected by copyright rights of HIS GLORY LIVES PUBLISHING. An in-depth study of the meaning of the term: KINGDOM OF GOD, which Jesus used more than any other in the Bible. When Jesus spoke of the Kingdom, He gave stern warnings of the dangers of not understanding it and thereby losing it. The tragic result of this loss has eternal consequences. A recent interview on a Christian Network devoted a complete program to the subject with various theologians giving their interpretations to the question posed by the title of this book. It was amazing to hear the various answers that each gave, such as: Personal anointing in one’s ministry; manifestation of God’s Presence in miracles and signs; fruitfulness and prosperity in living. While each of these answers is noteworthy, it seems the answers give more tribute to the believer than to the ONE in whom we believe. It is critical that the Christian understand WHO Jesus meant when He spoke of this term. Many believe it is a “What”, as the title alludes. The reality of the question should be “WHO” is the KINGDOM OF GOD? God’s Kingdom has many blessings, but the Presence of God Himself is the true meaning of the term: KINGDOM OF GOD. The result of having HIM will bring about all that is GOOD into one’s life, while on the Earth and, in the future abode of Heaven. One cannot receive “things” God has in His Kingdom until they first have HIM.